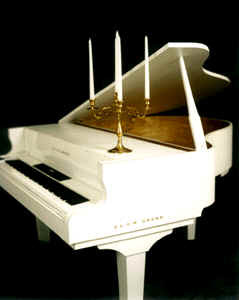 Welcome to the Slam Grand Piano Company where we produce the finest piano shells on the planet Earth! Why would the Olympic Committee and Centennial Events choose a SLAM GRAND Piano for the opening and closing ceremonies of this year's Olympics in Atlanta? Could it be the light weight for ease of set up and tear down? (The 6'8'' model weighs in at under 250 lb.) Could it be the limitless color possibilities for design and theatrics? (Polished black for Celine Dion & David Foster, Gold for Little Richard) Could it be that SLAM GRAND Pianos never need tuning? 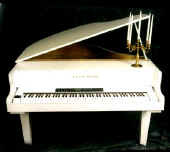 Or could it be the cost savings over other grand pianos? Maybe it was a little of all. More & more entertainers, hotels, convention centers, churches, schools, and homes are realizing the benefits of SLAM GRAND Pianos. The versatility of the product is evident, and because of the way it is manufactured here in the USA, its possibilities are limitless. Our 5'2" model, our most popular, was even used in a stunt during Superbowl 29, with breakaway legs designed by Disneyworld. SLAM GRANDS come with or without keyboards so as to utilize your own electronics or we can suggest and install our recommended digital keyboards. Other options now include: foot lyres, mounted boom brackets, flight cases, key cover-slammer lids, and a never ending supply of ideas to make your SLAM GRAND as unique as you are. Special orders to meet the needs and requirements of the client are accepted and encouraged. Please allow 6 to 8 weeks for delivery.